Compiled by Helen S. Durbin from various sources listed within. Eastern, Pa. 	   Washington Co., Pa.
II. Martin SUPLER (he owned a Hotel in Philadelphia, Pa.
Donegal township, Washington Co., PA.
6:00 p.m. Donegal twp., Wash. Co., Pa.
23-Nov.1803	   1C. Benjamin ELLOITT Jr.
m. Archie B. Callender Jr.
Maria Bell Potter (d/o S.M. & G.A. Potter d. 24-Jan.1868-7y3mo. (McClelland) Hutchinson of Good Intent by Rev. James C.
station on March 29, last, was interred. The life span of Mrs. Jane Kimmons Potter was closed at 5:30 p.m.
and 27 days. She had no disease & death was caused from heart failure. taken up by Mr. Kimmons, while the other two settled near Good Intent. youngest son and purchased the homestead farm where he and his wife resided. Claysville; Annie, widow of James Ackley, of Burnsville; Elsie, wife of H.P. pastor, Rev. R.T. Lynd. The attendance was large. The pall-bearers were J.S. from Jane Whiteman 8-14-86 to S.C.R. POTTER, Samuel 1860-1943; Lulu J. 1885-1966.
afternoon. Interment in West Finley cemetery. brother J.F. Ackley and 1 sister Mrs. Minerva Sargeant. Jane Whiteman to S.C.R., 8-14-86. $500. Age 27 born in Va.
cousin, farmer, B. W.Va. parents born Va.
68 single, He born W.Va. Parents in W.Va.W.Va. wife of Samuel Potter, of this borough aged 74 years. B. near West Alexander, Pa.
Richhill Twp.,	    │Greene Co., Pa.
│     	              died: Rivieria Beach, FL. near Majorsville, W│V. in West Finley Twp., Washington Co., Pa.
Greene Co., PA.       m. 5-Mar.1881-Greene Co., Pa.
m. 4-Sep.1872 by Rev. George Loar. near Jefferson, Greene Co., PA.
Richhill Twp., Greene Co., Pa.
Ruff's Creek, Greene Co., Pa.
m. 14-Dec.1871		West Alexander, Pa.
m. 15-Apr.1914 		Friday 6:55 a.m.
East Finley Twp. d. Mon. East Finley Twp., Wash. Co., Pa.
East Finley Twp. 10:20 p.m. 76ys. m. 26-Nov.1912-Tues. at Pittsburgh, Pa.
West Finley Twp. Wash. Co, Pa. Killed by a train 5:30p.m. Wed.
d. Time, Greene Co., Pa.
d. At home, Claysville, Pa.
East Finley Twp.m. (s/o George W. & Martha (Frye) Ealy) d.WashingtonHosp.Pa. 4:30 p.m. near Time, Morris Twp. Morris Twp., Greene Co,. Pa.		Morris Twp., Greene Co,. Pa.
East Finley Twp. Brick m. 1897			Enon, Pa.
Morris Twp., Greene Co. Pa.
Greene Co., Pa.			Thurs. 3 a.m. Wash. Hosp., Pa.
Marshall Co., WV     m. 1893		West Alexander, Pa. 9 p.m.
Time, Greene Co., Pa.			Washington Hosp., Pa.
22-Jul.1904 (source) 7E. Lula Viola TOLAND (res. West Finley, Pa.
Nineveh, Pa.(9E. 10 gr-ch/1 gt-gr-ch at death)Breese Nursing Home 7:25am Mon. 7-Apr.1918	      m. Arthur J. Dailey Jr.
m. Ed. J. VanLiere M.D. West Alexander, Donegal Twp., Washington Co., Pa.  next 2: West Alexander, Pa.
Roney's Point, WV     m. 20-Sep.1906	St. Petersburg, Fla.
m. 20-Mar.1886, Marshall Co., W.Va.
Elm Grove, W.Va.					Wheeling, WV. Wheeling, W.Va.	      m. 25-Feb.1911 			Elkins, W.Va.
little one. How is he? Fine I hope! Stark Co., Ohio & was still living in 1850! Nancy Rolins; & died 8/10/1894 in Hardin Co., Ohio. 4. Susanna b. 8/31/1809? married to Charles Russell. Union Co., Ohio in 1855. 10. Ann S. b. 3/30/1822. Jonathan is our ancestral line. His wife was Mary Jane Keller b. 1. Daniel b. 8/17/1819 & married Annie Wayne 9/2/1895 & he died 1915! 2. Susanna b. 10-29/1844 & married an O'Neill. 3. Embree b. 10/22/1846 & died 3/1/1865 in Civil War. West where he was shot and killed 1887! 6. John Henry b. 9/9/1853 never married & died 2/5/1920. 8. William b. 1/30/1861 & married 9/9/1886 to Lucy Heialy & died 1938! James Riley was our ancestral line & he & Amy Jane had eight children. Elizabeth Cathon & Mary Dague! 3. Jennie Alma b. 5/4/1882 & died 3/6/1883. 4. James William b. 2/8/1884 married May Fox & died 9/14/1961. 7. Thomas b. 3/29/1896 married 4/21/1921 Ruth Aeillig. 1. Warren Elvis Mangus b. 8/8/1923. P.S. 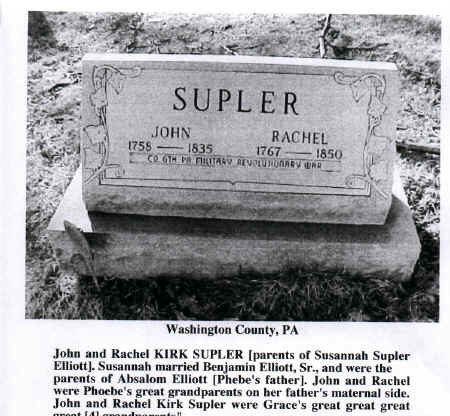 Any data on the Kirk family or more on the Supler? In Chester County. Established in 1737, from Newark, or Kennett and Concord. century and was buried in Friend's graveyard at York. Pike Run, Elizabeth JOHN, dt Joseph & Mary, Washington Co., Pa.
Run, Ruth McCALL, dt of John & Sarah, Washington Co., Pa.
Run, Rebecca Deulea DULY, dt John & Aves, Fayette Co., Pa.
Alice, Mary, Moses & Francis, rocf Warrington, MM, dtd 1796, 2, 13. 1802, 12, 25. Benjamin dis mou. 1815, 11, 30. Francis [Elliot] get Marlborough MM, O.
James, get West Marlborough MM. 1816, 5, 23. Moses & w, Rebecca, get Marlborough MM, O.
Edward Supler. Eliza was a daughter of John and Jane Brice. living or past relatives, I'd like very much to hear from them. interested in Samuel Lee Chambers and Lucinda Powers, who were born about 1836. Both of those couples were married and are my gt.gt. grtandparents. erected gave me a great sense of pride. I grew up on Stone Church Road right next to the cemetery where Rev. history. She is now at the Lancia Nursing home in Steubenville, Ohio. me the opportunity to find their final resting place. Genealogy of the Kirk Family, by Miranda S. Roberts (1913). been most useful in my research work. I'm eternally grateful. believe I'm going to sent you back to your charts again. son of John (2). He was a farmer, also a Democrat and Methodist, (good lead). Jane, Nancy, Maggie, Elizabeth, and Mary. member of Elks, Knights of Pythias and Christian Diciple Church, of Clarksburg. Greene Co. She was still living at the time of this article was written. J.B.
E. born in 1884; both were working on the farm with their father. Davis, my gt.grandfather. Alfred was born 3-1836, in Ohio Co. Va. and died Dec.
Sarah Jane, born Feb.1828, in Washington Co. and died age 75 on March 7, 1907.
my gt.gt.gt.gr. Richard Davis is buried there with his wife, Sarah Bonnet. Ellen Supler, b. May 24, 1864, d. Ju_.28, 1928, Elizabeth M. Supler, b. Feb.
Laura Supler McGinnis 1862-1937; Charles Robert McGinnis b. Aug. 1, 1923- d.
Aug. 10, 1923. This is by no means all the relevant names but is what I have. think even better. You find one, & you'll find others there also. might have significance. It is a distant possibility. opened my envelopes three times. I wasn't sure you had received my first letter. As to your question or relationship to Lucinda C. or Lucinda Cummins. try to help in this regard. in the Revolutionary war, as a Private and Seaman. to commence of the 4th day of March, 1848. R.S. Rose, Allen Cile, N.G. commanded by Captain Rudolph of the _________ commanded by _______ in the Penn. Lindsey but I am not sure part of this session was under Captain William Brook. merchants. Vessles-returned into port at Philadelphia, in April. I was born 20th October, 1758.
the Agency of any State or Territory. Sworn to and subscribed this day and year aforesaid, October 1832.
have been a soldier of the Revolution and that we con___ in that opinion. the acts subsequent there to--. and had children born prior to the first day of January, 1794. Isaac Hodgens a Judge of the Court. above named declarant still remains his widow. The Will of John Supler, dec'd. best of their knowledge, observation and belief Benjamin Potter, Robert Chase. And sworn to and subscribed before me Jno. Grayson, Regr. duly sworn. Jno. Grayson, Regr. the state of Pennsylvania. Originally they came form England. children: William, of whom further; John, Isaac, Rachael, Elizabeth. county. He was a Democrat in politics and in his religious belief a Methodist. He married Ann Gary, who is still living in Greene County, where she was born. further; Jane, Nancy, Maggie, Elizabeth, Mary. the Christian or Disciples church at Clarksburg. born 1884; both are engaged on the farm with their father. Among others Robert A. Genther author of this section. William Addison Genther b. 6-May.1890 Wheeling, Ohio Co., W.Va.
Jane (Stockton) Brice. John was born ca. 1760 d. 20-Aug.1811; Jane was born ca. 1769 & d. 1-Apr.1853, d/o Robert and Mary (Makemie) ((d/o John Makemie)). Robert was the s/o Thomas and Margaret (Fleming) Stockton. Rev. John Brice m1. Rebecca Kerr b. d. 1-Jun.1794. 1910 Triadelphia Twp., Ohio Co., Elm Grove, W.Va. 26-Apr.1910. Enumerator David B. Heiskell, Precinct 5. Carrie Lee dau  W. F    23  s " " " Sales woman  retail store dry goods.
" McClelland Jr.  s. W.M. 9  s " " "  "
"	Cornia     dau  W. F.    4  s " " "  "
Lowther,  Chambers       gr-son W. M. 1 1/2 s. " " " "
(previous); and Correna H. Davis Foster, b. 20-Nov.1905. buried in Stone Church Cemetery, Elm Grove, W.Va. His mothers name was Jane. Davis; and Elizabeth Davis b. 1839 m. Edward Butler. W. Chambers b. WV. 1854; John W. Chambers b. 1856, W.Va.; Theodore Chambers b. 1858, W.Va.; Slater Chambers b. 1860 W.Va.; and Mary Chambers, b. 1865 W.Va. m.
Strope, who obtained the original patent from the Commonwealth of Pennsylvania. H. Strope, d. Mar. 2, 1848, aged 12 years, 6 months, and 14 days. church was built in 1881. John Supler, to Charles Allum 1850. John Supler, to Morrison Jones 1850. John Supler, Sr. to Henry Ewing (this was his son-in-law) 1864. John Supler, Sr. to John Supler Jr. 1864. John Supler, Jr. to Isaac Supler 1866. John Supler Sr. to William Supler 1864. John Supler ux to Isaac Supler 1871. John Supler Jr. ux to John Leslie 1866. J.L. Supler at J.V. Vandergriff 1855. James Supler & Gdn al to George W. Reed 1888. J.L. Supler to S.A. Hughes 1890. John Supler b. Feb. 5, 1790, d. Apr. 28, 1871--81years. Mary or Margaret Sargent Supler, b. April 23, 1788, d. Sep. 4, 1880.
listed in Beers History of Washington County, Pa. Family Bible Records. Elizabeth Supler, born Dec. 2, 1811. Thomas Supler, born Feb. 25, 1814. William Supler, March 26, 1816. Samuel Supler, June 6, 1818. Rachael Supler, Sept. 12, 1820. Isaac Supler, Dec. 17, 1822. Margaret & John, twins Sept. 7, 1825. Henry B. Supler, Mar. 14, 1828. Mary Jane Supler, b. Aug. 5, 1834. Sarah Ann Supler, b. Aug. 5, 1834. William Supler, b. Mar. 26, 1816 de. 1872 m1. Lucinda (Cummins) m2. Samuel Supler, born, June 6, 1818, d. April 5, 1825. 6 yrs, 2mo. 29days. Buried in Supler Cemetery, removed to Enon in 1981. 94. Buried in Ruff�s Creek, near Waynesburg. (Obituary). Margaret Supler, born Sept. 7, 1825, d. Jan 30, 1877 m. John Wise, b.
July 20, 1815, d. Feb. 1885. Buried in Prosperity Cemetery. John Supler, b. Sept. 7, 1825 m. Emeline ((Gregory-(H.S.R.)). buried in Supler Cemetery, removed to Enon in 1981. Supler Cemetery, removed to Enon in 1981. Sarah Ann Supler, b. Aug. 5, 1834 d. 1907 m. Henry Ewing 1835-1906.